Barcelona’s oldest flea market dates back to the 14th century and is one of the oldest in Europe. More than 500 stalls sell everything including vintage clothes, antiques, books, furniture, electronics…the list goes on! Part antique fair, part jumble sale, get there early to witness the raucous public auctions take place. Stalls now sit beneath a stunning mirrored canopy designed by Fermin Väzquez with great views of the nearby Agbar Tower. 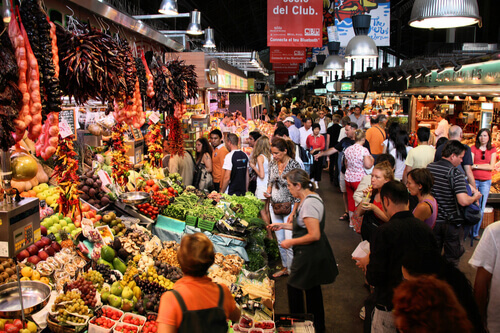 It’s neighbour, La Boqueria on La Rambla, might be more famous but Santa Caterina is our favourite. While less touristy, it’s still packed with locals, restaurateurs and visitors who head to Santa Caterina for their fish, meat, fruit and veg. Stop for a snack and a pick me up at one of the surrounding tapas bars. Tapas La Torna serves excellent meatball stews and roasted asparagus. Make sure to get a look at the famous wavy roof, covered in brightly coloured tiles and designed by architect Enric Miralles. Mondays, Wednesdays, Saturdays, 7.30am – 3.30pm; Tuesdays, Thursdays, Fridays, 7.30am to 8.30pm; Sundays, closed. Barcelona’s permanent vintage market in the neighbourhood of Sant Cugat has nearly 100 stalls selling antiques, furniture and art. Housed in wooden huts, the stalls sell all kinds of vintage goods – perfect for gift shopping. The area has a party atmosphere with live bands performing regularly and food stalls to keep the hunger pangs at bay. 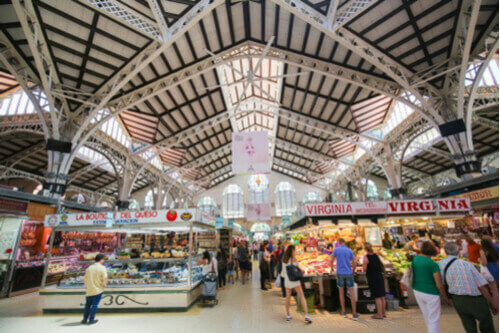 Dating back to 1928, Valencia’s main market is situated in one of the city’s most beautiful buildings. Tucked away in Ciutat Vella, or the old town, the ceramic domes and iron and glass frontage of this incredible piece of Valencian architecture are alone, worth the trip. Today, it is still one of Europe’s largest markets with more than 1,200 stalls, ensuring this is a gastronomic delight for food lovers. Fresh fish, meats, fruit and veg are aplenty but try the hams, olives, cheeses and other local specialties along with the local horchata – a rice milk and cinnamon drink. Since the early 19th century, this weekly market has been held in the small round plaza (Plaza Redonda) in the centre of Valencia. What was once a fish market has become a flea market with a small number of stalls selling arts, ceramics, linen and other trinkets. Situated around a central fountain, it’s much smaller in size compared to the Mercat Central but offers some lovely, quirky crafts. Valencia is the birthplace of paella so this is the place to find an authentic paella pan to take home with you. As is the case with Spanish markets, there are plenty of tapas bars in the surrounding area for you to have a refreshing caña (small draft beer) or some olives. 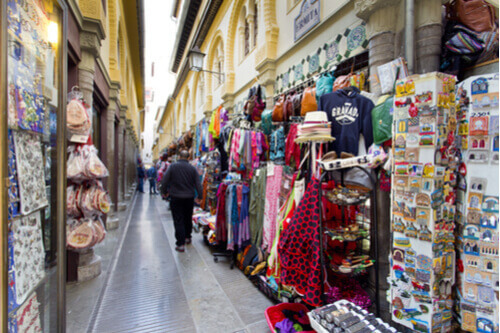 The Alcaiceria flea market is more a Moroccan souk than a European market. For centuries, this was a Moorish silk market and continues to have the feeling of stepping back in time and into a Grand Bazaar. Weave through the narrow alleys lined with colourful silks, linens and leathers. Smell the dried spices and marvel at the painted ceramics and hanging stained-glass lanterns that add to the Arabic flavour. Make sure you bring a camera as the colours and visual delights are astounding. 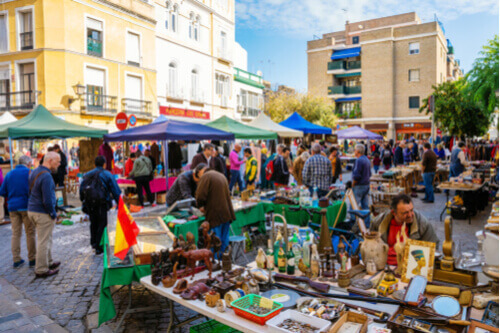 This is Seville’s oldest market – some say dating back to the 13th century – and is a great place to look for bargains and souvenirs. With more than 100 stalls crammed into a long narrow street, you might find vintage posters, old gramophones, antique furniture or second-hand books. This market really is a feast for the senses with bright colours, sounds and characters. Unlike so many flea markets that sell cheap rubbish, this one really is exceptional. Named the Thursday market for a reason, it’s only held once a week. 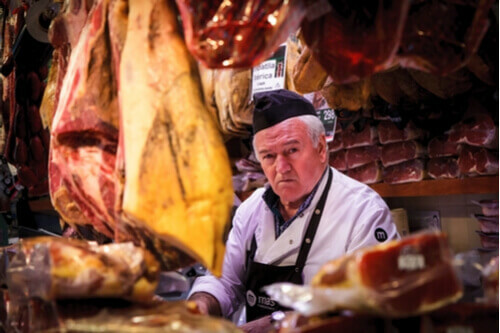 This is the most famous market in Madrid – and arguably the most famous in all of Spain. Just off the bustling Plaza Major and built in 1916, the iron and glass structure is a sight to behold. It was renovated in 2009 and now is a gourmet food market. Don’t expect to find too many locals doing their weekly shop here, this is all set up for those looking to spend an evening grazing on beautifully prepared tapas. Think thinly sliced cured Iberian ham, squishy Manchego croquettas or garlicy tomatoes slathered on crispy bread all washed down with Tinto de Verano – wine mixed with fresh lemonade. Is it a bit touristy? Yes. Is it cheap? No. Is it worth it. Oh absolutely. Spain’s biggest open air street market comes alive every Sunday in one of Madrid’s oldest streets. The market is jam packed with people browsing the literally thousands of stalls looking to pick up some new underwear, a second hand fridge or maybe a flamenco dress. The main strip is mostly dedicated to clothing but get lost down all the side streets where all kinds of bric-a-brac can be found. It’s ideal for people watching from the comfort of a tapas bar that run alongside the market place. Held monthly by Madrid’s Railway Museum (designed by Gustaf Eiffel of Eiffel tower fame) expect to find vintage clothing, screen-print art, vinyl records and other very on-trend items. The food trucks that feed the hungry hipsters who come here, do sell Spanish favourites but also expect chicken wings, duck wraps, craft beer and whatever the young cool crowd are into that month.